Our graduates have successful careers in public, private, non-profit and multilateral organizations. Here are some statistics and sampling from recent graduates. Graduates found employment in the private, public and non-profit / multilateral sector while others pursued further education. Over 25 percent of our graduates find employment outside the United States while the rest are located in areas such as New York City, Washington, San Francisco and cities throughout Southern California. 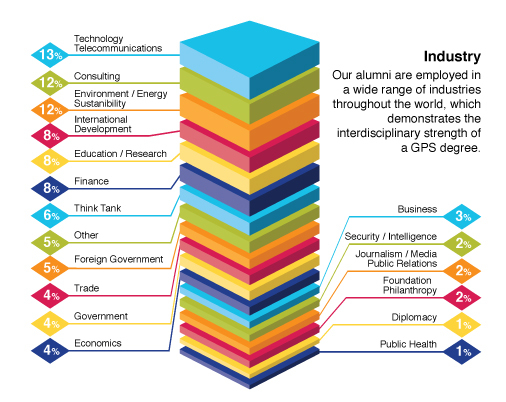 Our graduates are employed in a wide range of industries throughout the word. Following is a sampling of key industries. Average salaries for graduates employed in the U.S.